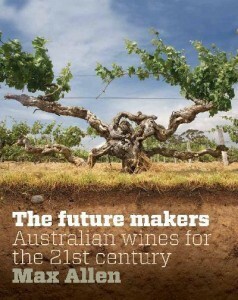 Well known Australian Wine writer Max Allen has just released his latest book titled “The Future Makers”. Faced with the unprecedented challenges of over supply, global financial turmoil and climate change, Australia’s finest grape growers and wine makers are beginning to think long term and in the process starting to better understand the unique relationship they hold with the land. Within The Future Makers the reader will find extended discussions of the current issues moulding Australia’s wine makers along with an exploration of the issues and challenges facing the countries grape growers. This book takes the reader around the country on a journey introducing the areas and people shaping Australia’s wine industry of the future. Regional chapters feature feature in-depth profiles of top winemakers, both those that are upholding the industries priceless traditions and those that are at the cutting edge of innovation. Sydney’s most famous food and beverage establishments will once again gather in Hyde Park North on October 30th, 2010 from 12-5pm; donating their time, effort, skills and produce to help create the Sydney Food & Wine Fair – this year celebrating 20 years of giving. The annual foodie event is part of the Crave Sydney International Food Festival. Each year it teases the taste buds of those who flock to experience the signature dishes of some Sydney’s most renowned restaurants whilst enjoying a glass of wine from their favourite vineyard. Add a sparkling splash of entertainment in the splendour of Hyde Park North and you’ve got the perfect social setting in which to sit back, relax and spoil the senses. This 20th anniversary year is already creating excitement, with Café Sydney, Flying Fish, Wildfire, Bourke St Bakery, Otto Ristorante, Longrain, Icebergs Dining Room & Bar, Quay, Jimmy Liks, Jonah’s, Sailors Thai, Tempus Two, De Bortoli Wines, Brown Brothers and Parker’s Organic Juices happily lined up to participate. Managed as four regional businesses in Australia and New Zealand, The Americas, Europe, Middle East & Africa and Asia. Treasury Wine Estates will become the new identity for the Foster’s Group Limited global wine business. Bringing together 12,000 hectares of vineyards, 20 wineries and 50 wine brands, Treasury Wine Estates will have some of the most popular and collected wines from Australia, California, France, Italy and New Zealand under its umbrella. With sales totalling over 35 million cases of wine annually, and revenues of over AU$2 billion Treasury Wine Estates employs over 4,000 winemakers, viticulturists, sales, distribution and support staff across in 12 countries. The world’s most prestigious and influential independent wine competition, the International Wine Challenge (IWC), has unveiled the results of the 2010 Trophy and Great Value Wine Awards today at the Lords Nursery Pavilion in London. 111 wines were awarded a Trophy this year, along with 14 Great Value Wines judged for their style, availability and price. France had the honour of coming top for the second year running, with 21 wines being awarded a Trophy, followed by Japan’s Sake category (14) in second place and Australia (12) in third, closely followed by Portugal (11). Meanwhile Germany, Italy and New Zealand were each awarded 8. Camel Valley is England’s champion for 2010, winning the English Trophy for the second year running with its 2008 Pinot Noir Rosé Brut and more importantly the Sparkling Rosé Trophy, beating a high calibre of international competition. The Trophy stage is the final round for these award-winning wines. Having already achieved a Gold medal through the Challenge’s rigorous judging process, the wines are tasted once more by an elite panel of judges against other wines in the same category, to determine if they are worthy of a Trophy in addition to their Gold medal. Chris Ashton, IWC Event Director says: “The IWC has once again given support to the international wine market with these respected and influential awards. Winning a Trophy or Great Value Wine Award gives a wine real prestige. It is a well-earned recognition of the dedication and commitment that has gone into producing a top quality wine and puts the producers on the wine map of the world. This year saw the highest-ever number of countries entering the competition with 46 nations battling it out on the wine field. Global wine expert and TV personality Oz Clarke joined the formidable judging panel of IWC Co-Chairmen – Tim Atkin MW, Sam Harrop MW, Charles Metcalfe and Derek Smedley MW.